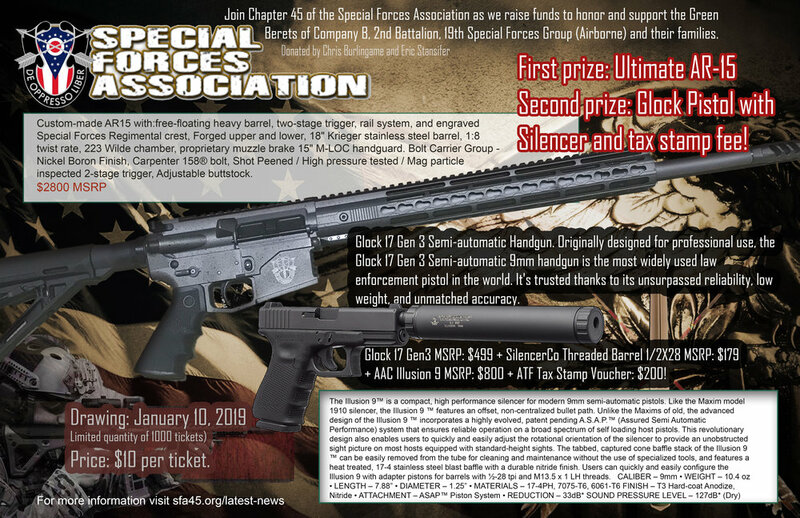 The raffle drawing for the AR-15 and Glock Pistol was postponed to the January Columbus SFA 45 meeting on 1/10/2019 at the AMVETS POST 89. At the meeting we used their drawing tumbler. The event was recorded and the video was posted on our Facebook page. The link is below to see the video of the drawing. Special Forces Association Chapter 45 is sponsoring a raffle to raise funds to support the men and families of Co. B, 2nd Bn, 19th SFGA. We have a total of 1000 tickets for sale at $10 each for the chance to win one of two quality firearms. With only 1000 raffle tickets, this provides 1 in 500 odds of winning. First prize is a custom manufactured AR-15 configured for Three Gun competition, valued at $2800. Second prize is a Gen 3 Glock 17 9MM pistol with an additional threaded, match grade barrel and suppressor with a $200 voucher to cover the tax stamp, package valued at $1400. Refer to the attached flyer for detailed information on the firearms. The winners have the option to travel to north-west Ohio to receive their prize or provide contact information for a local FFL dealer the firearm can be transferred to. All NFA rules apply. Tickets can be purchased from select SFA 45 members or by contacting Jim Wetz at 724-208-8671 or JWSFA45@GMAIL.COM. This 2018 raffle ticket results will be published soon for all events. Six SFA 45 chapter members were inducted into the Ohio Military Hall of Fame for Valor during a standing room only ceremony at the Ohio Statehouse on 5 May 2017.
president Mark Arnold. Other chapter members sitting including OMHOF for Valor member MSG(R) Norm Lambert (SSM - Korea, BSM - Vietnam). B/2/19 Christmas Party AAR. Lots of fun and the guys and wives of the unit FRG did it right. They also bought gifts for each child of a unit member. Mike Robinson posted great photos in the chapter’s Facebook page; check it out. Columbus Veterans Day Parade. Good turnout and well-supported by the real men of B/2/19 as drivers of their cool vehicles. Tom McGrath is lead this initiative. We were supported by two SF RAZRs and one LMTV. The Parade began at 1200 hrs. Carl Fuller. AAR: B/2/19 did a great job of supporting this with three vehicles and motivated drivers. The parade was a huge event at this large festival, and small town America showed up in the thousands. The Motorcycle Poker Run and Cookout was held Oct 1, 2016. There was 50/50 raffle. It was held at Circleville, Ohio AMVETS building. The ride was about 90 to 100 miles enjoyable and safe route with stops at various VFW and American Legion halls. The OSU game was watched on television at the AMVETS site at the end of the Run. It is a huge building and loaded with amenities. 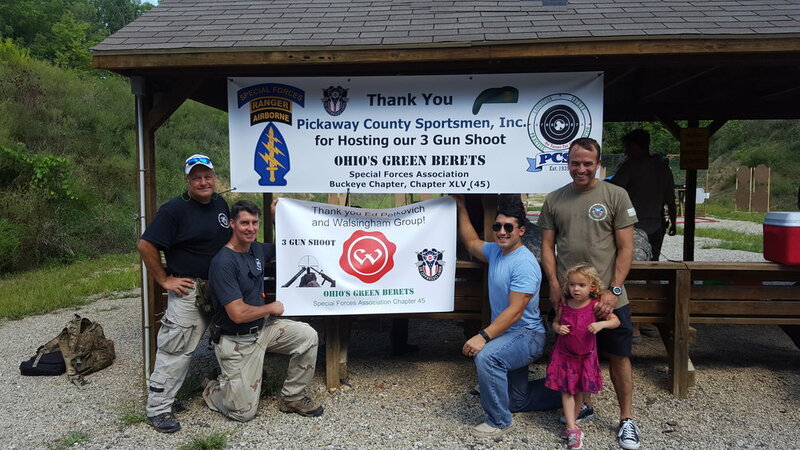 The Special Forces Association Buckeye Chapter's first Annual 3 Gun Shoot was a marvelous success. Although almost none of us had ever been to one, several chapter members competed along side over 20 members of B company, 2nd BN, 19th SFG, as well as several sponsors. Many other members of B company and their families watched the shoot and enjoyed the hospitality of the great Americans of the Pickaway County Sportsmen, Inc. (PCSI). The Shoot featured a familiarization fire and "warm up" shooting bay, and four shooting bays each with unique target arrays and obstacles for 3 guns per bay. Chapter member Mark Scott and a team of volunteers from SFA 45 managed and worked dozens of hours to make this a success. New Honorary Chapter member Jason Conrad was PCSI's anchor man who managed the competition and set up the multiple target arrays with his volunteers from PCSI and others. Several Green Berets from B/2/19 volunteered as shooting coaches to civilian shooters. Special Forces A Team members recently returned from Afghanistan reunited at the Pickaway County Sportsmen range with retired team member MSG Sean Clifton, whose life they saved on a previous deployment. MSG Clifton was the first guy through the door on a raid into a Taliban compound, and he took three bullets. A Special Thank You to all our Sponsors. Without your help we could not make this happen. SF Guys had unique opportunity to coach their wives. Golf Outing AAR: Roger Hobson did a great job of managing what resulted in a very successful event on 30 July. Jesse Boyd, Jan Hauger and Ted Mosure were the event support team. appreciation to chapter members who raised $1900 in hole sponsors, with a special recognition of Jeff Gallaher who recruited five sponsors. Over 50 members and SF guests attended our three lunches this month. Sunday's weekend lunch was a success with 15 spouses also attending. Some photos of the 26 June lunch in Wilmington, OH are posted in the Photo Album. 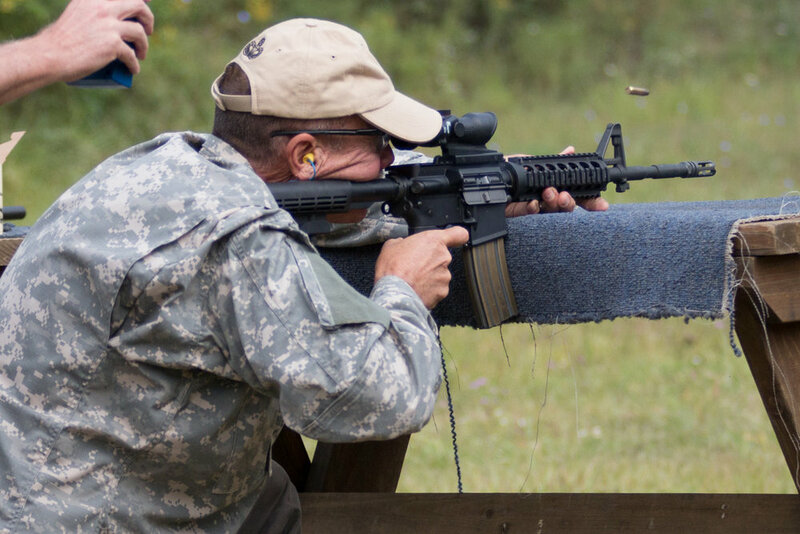 A SIG M400 AR15 with tactical scope is being raffled by SFA Chapter 88 to fund the travel expenses for the six living Special Forces MOH recipients (and their caregivers) invited to this year's SFA convention in Jacksonville, FL 13-18 June. The tickets will be mailed to your return mailing address. The tickets will also be available at our monthly meetings. With over 129 members we continue to grow strong with continued renewals and lifetime members spanning over 10 states.